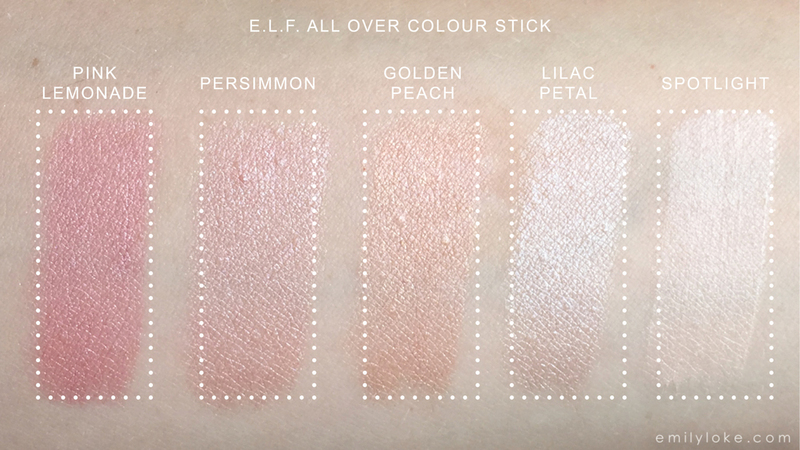 Today I got really ambitious and decided to review three different highlighter formulas form E.L.F. 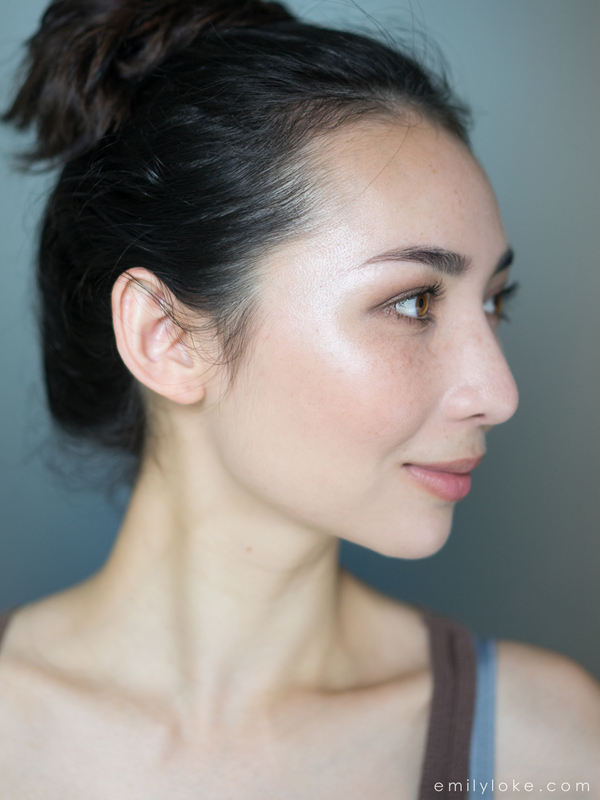 – their Shimmering Facial Whip, All-Over Face Color and Studio Baked Highlighter. For um…science…I decided to pick up multiple colours in some of the products. Obviously while some are fine as highlights, some would just work better as blush. 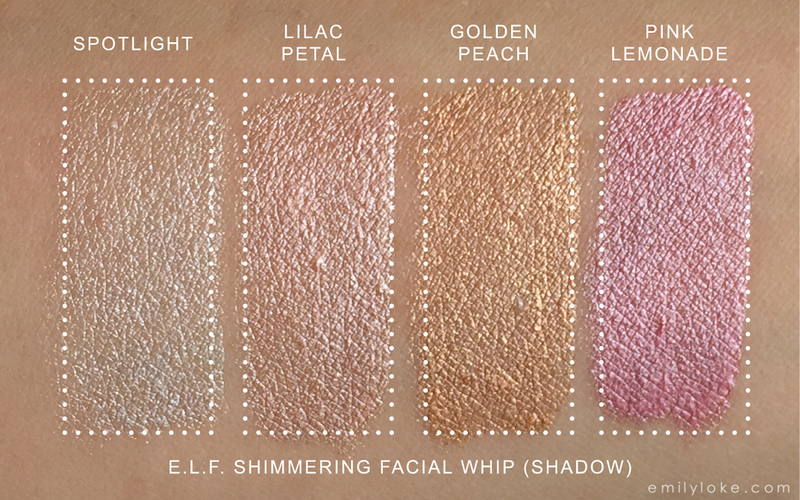 First up, here are some swatches of their Shimmering Facial Whip. Overall, the formula was fairly thick, quite sparkly and smelled like Froot Loops. 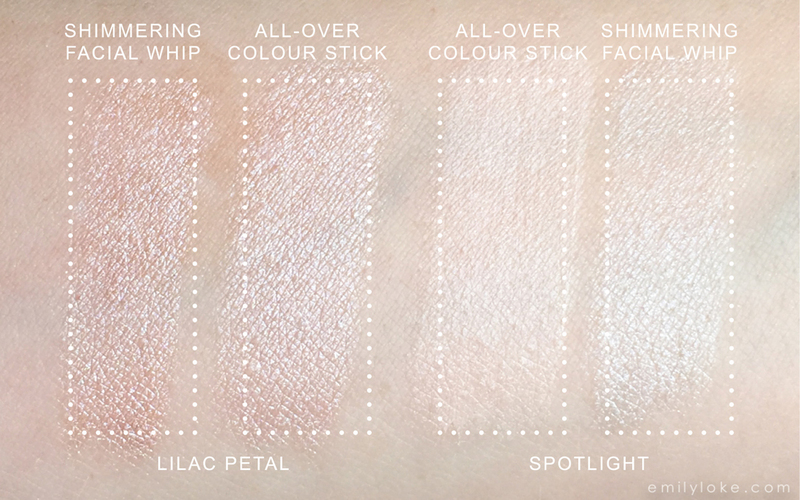 The two colours I could possibly use as highlighters were Spotlight (bright white) and Lilac Petal (light pink). For the record, Golden Peach was a total bust for my skin tone, but I actually really liked Pink Lemonade for its slight blue shift. 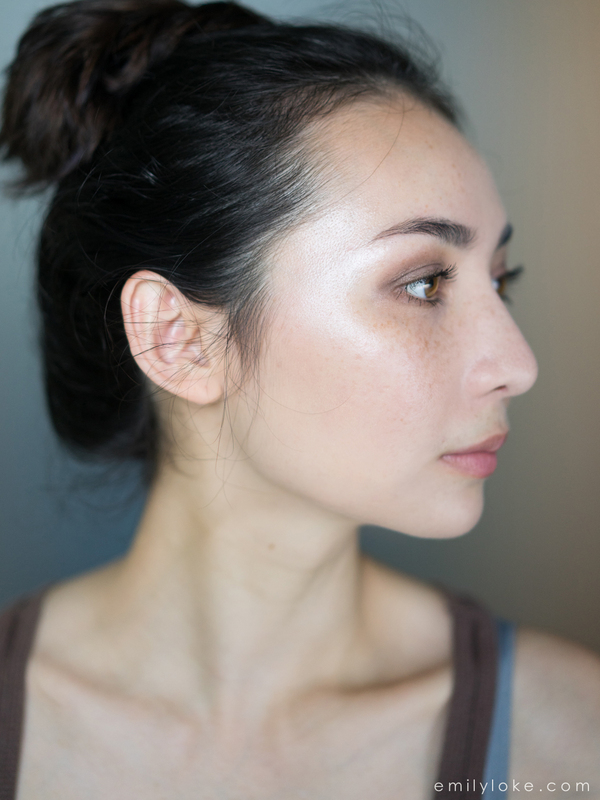 Lilac Petal is mentioned a lot as a dupe for Benefit’s High Beam, but I don’t see it. In a thick swatch it has a much more of a distinctly pink undertone, and blended out it’s more frosty than High Bream, which has more of a sheen/glow on me. Spotlight was more glittery in real life, but in photos they looked almost the same. Though I had high hopes for these, I felt they were a bit clumsy. 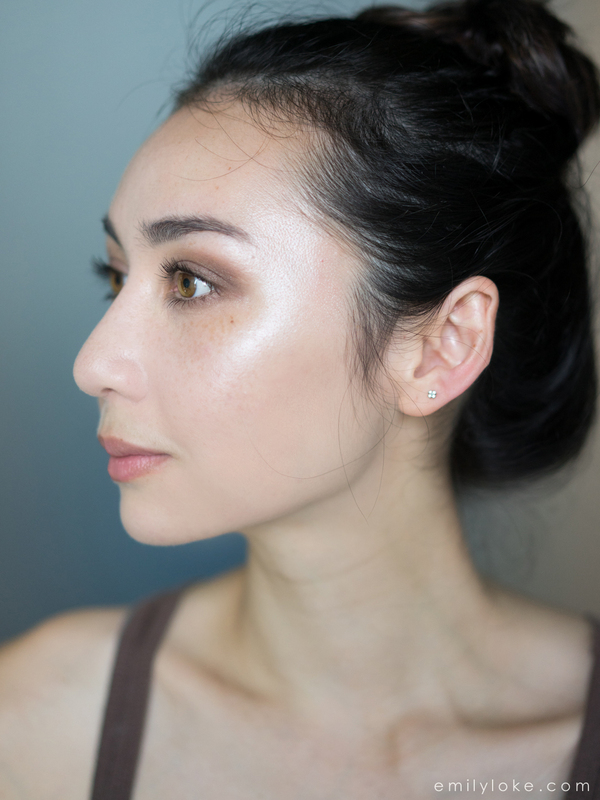 They applied patchy (you can see this is the first swatch photo), and were too sparkly to be mixed with foundation for a dewy look. I know you get what you pay for, but I wish these were at least a little less glitter-fest and a little more luminous. Next up were the All-Over Face Colour cream sticks. These smelled like Froot Loops as well, but overall had a much finer shimmer and smoother texture. You’ll notice that while Lilac Petal looked similar in shade to its liquid counterpart, Spotlight was very different. The cream version had a really beautiful pale champagne sheen that wasn’t sparkly at all. I really, really liked the All-Over Face Color version of Spotlight. 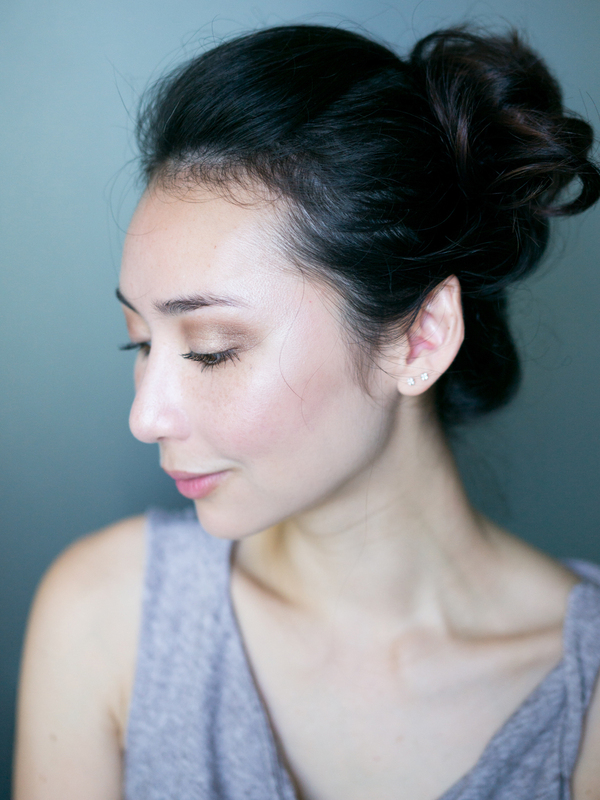 It blended out to a luminous glow with a bit of an opaque white undertone that gave my skin a subtle dimensionality. 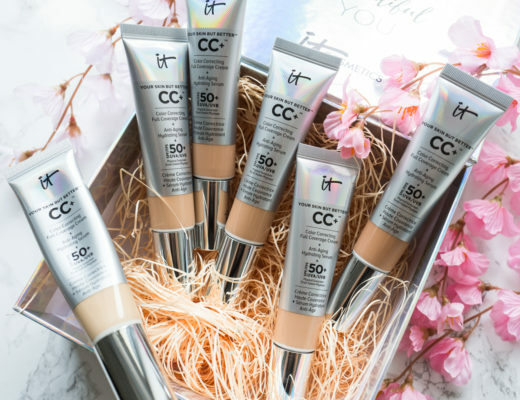 It’s unusual for its lack of frost, which makes it a unique stick highlighter to own. I prefer it over Sonia Kashuk’s Chic Luminosity Highlighter Stick. 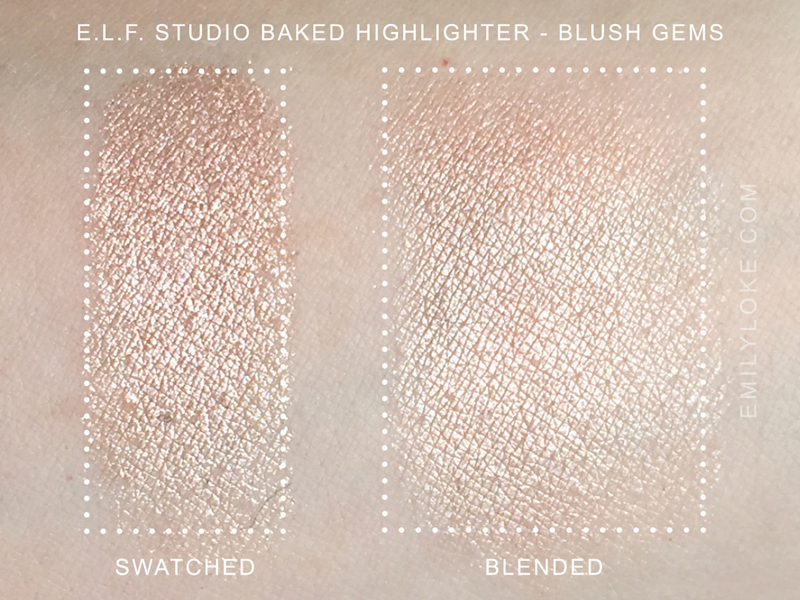 Last but not least, the Studio Baked Highlighter in Blush Gems. I picked this color in particular because it’s supposedly a dupe for MAC’s soft and gentle, which I want…but deep down know is too dark for my skin as a highlighter. This was a fraction of the price however, so why not? Though it doesn’t show in photos, the peach-bronze undertone was a bit too dark for my skin when it wasn’t reflecting light. Still, this was my favourite highlighter of the bunch! I’m convinced it’d look amazing with some tweaks to my application technique and placement, so I’ll definitely be revisiting this. 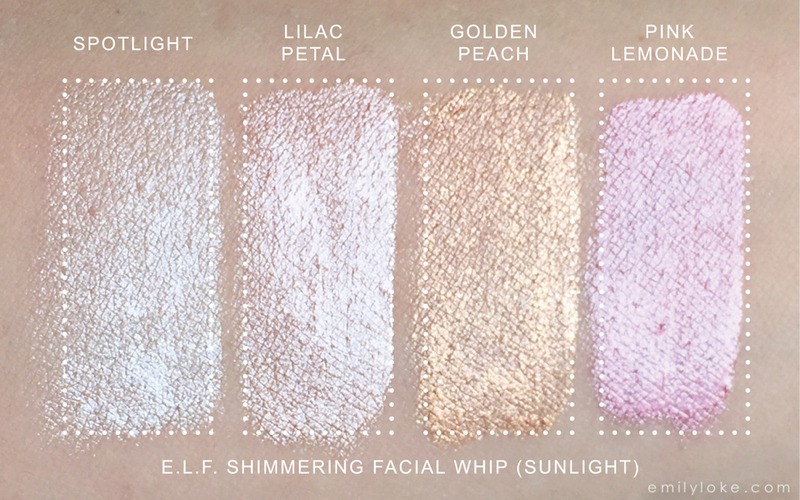 In summary: For liquid highlighters, E.L.F’s Shimmering Facial Whips are too glittery/not luminous enough for my liking. The All-Over Color Sticks are much nicer in formula, especially Spotlight which has a slightly opaque undertone with a refined gleam. 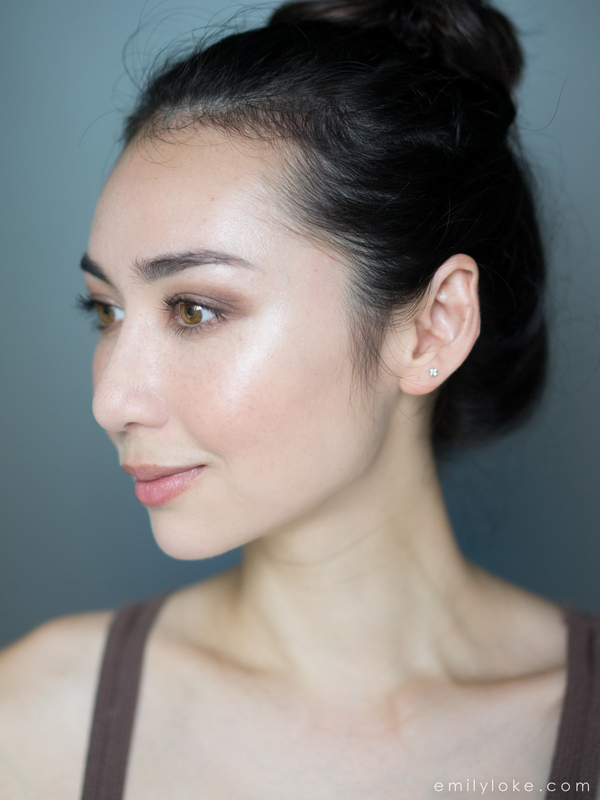 The Studio Baked Highligher in Blush Gems has a nice texture and is very pigmented – definitely worth it, especially if you’re looking for a dupe of M.A.C. Soft and Gentle.